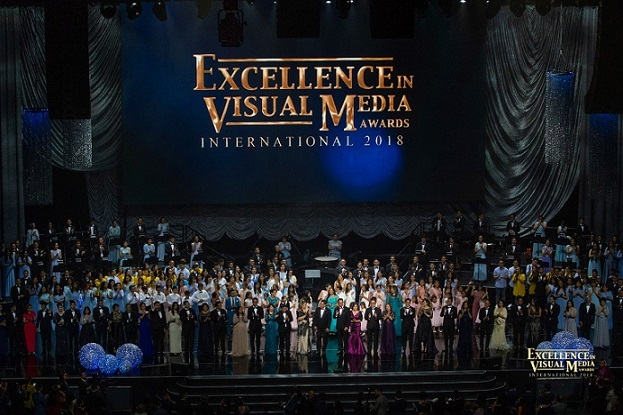 Recently we were delighted to work with super-creative Event Planner Melissa Valentin and her impressive team at Iglesia Ni Cristo, an innovative church that started in the Philippines back in 1914 and moved to the west 50 years later to become more prevalently known as The Church of Christ. Since they are celebrating its “50 Years In The West” they are holding special events all year across the country. 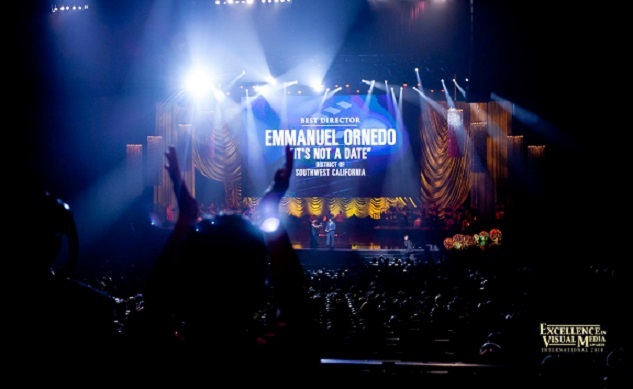 One of these exciting events happened right here in Southern California at the Microsoft Theatre in downtown LA. 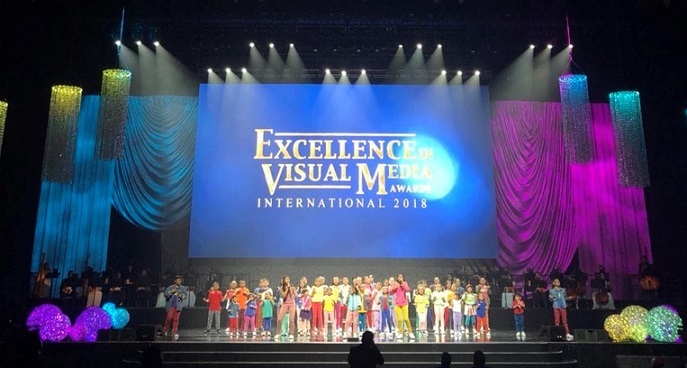 Melissa and her team from the church produced and showcased this past fall’s “Excellence in Visual Media Awards 2018”, and were beyond thrilled that it turned out to be an absolute success! They needed to design a grand, dramatic stage that would be stunning and extraordinary on its own, and yet still be seen by their spectators all over the venue, both near the stage and way up on the balcony. And these drapes also needed to be versatile enough to allow their lighting team to help change the entire mood and feel for each segment of the ceremony, too. Being able to utilize their venue’s house 30’h x 60’w Silver Regal Satin Austrian drape (actually a SW-custom built purchase from the past, so we knew it would be gorgeous! ), they came to us wanting to add a few breathtaking, larger-than-life theatrical “embellishments” to truly knock their audience’s collective socks off. It’s always amazing to see how much of a huge difference fabric choice can make when creating a custom, unique stage design for your special events. 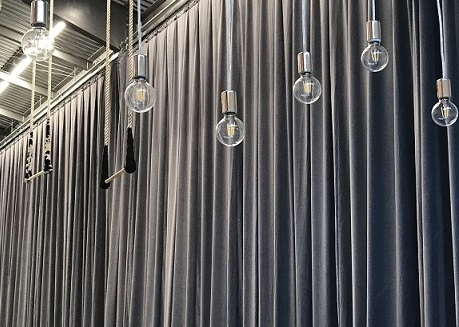 Since they knew that the material on these theatrical curtains were going to be unconditionally vital in constructing their distinctive stage design, they decided on using some striking rental curtains from our Silver Satin Drapery Collection, which worked impeccably with the house Austrian. Setting the stage with our 16’h x 30’w and 22’h x 40’w Silver Satin Crushed Swags gave their design an exceptionally unique, modern vibe. And adorning each side of the proscenium with our tall Silver Satin Crushed Pre-Pleated Drapery Legs was the perfect way to beautifully complete the look. Seeing a flawless event design turn out so picture-perfect was an incredible privilege, and we were so pleased to have been a part of it. 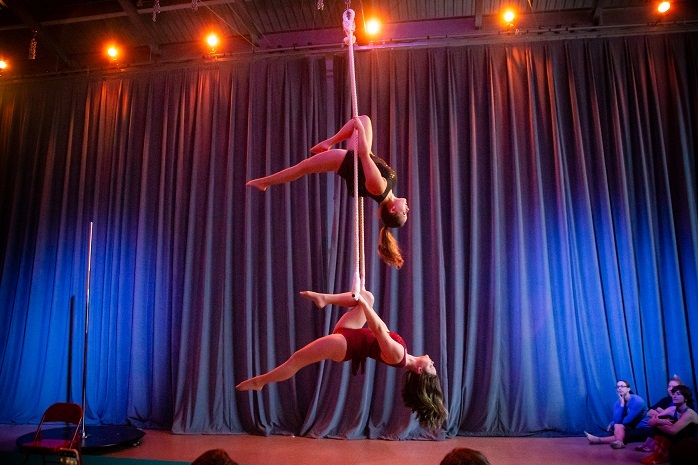 Next time that you have special event, theatrical production, awards ceremony, trade show, concert tour, or anything else coming up on the horizon, give us a call or pop us an email. 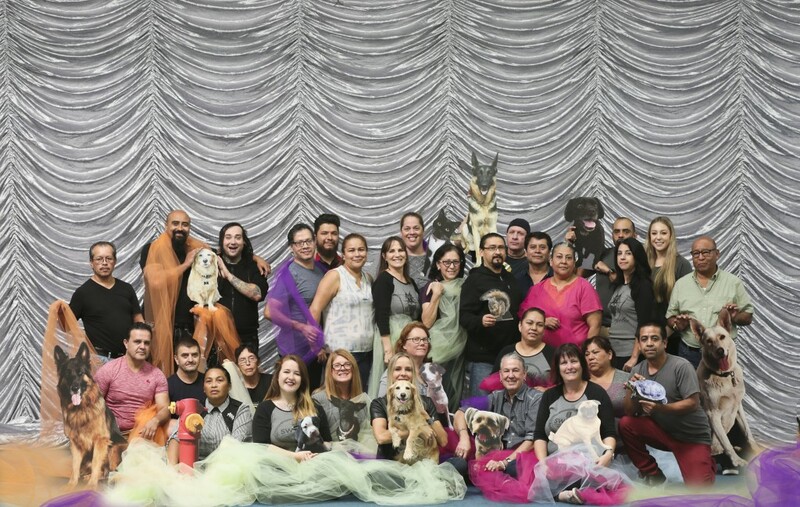 Let our sales representatives also assist you with creating the most eye-catching, magnificent event designs you could ever imagine using our custom-made drapes, theatrical rental curtains, or a marvelous combination of both! 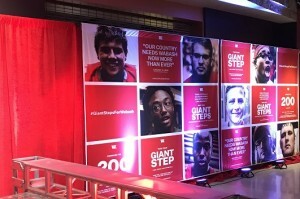 Having a digitally-printed backdrop is a fantastic way for you to get the name, branding, image, graphics, or anything else seen by your audience in a very memorable, effective manner. We are always excited and eager to work with our clients within their budgets and design aesthetic, to help create for them the most amazing theatrical curtains imaginable. Sometimes it makes more sense budget-wise and design-wise to not necessarily digitally print the entire drape if it’s going to consist mostly of an image/verbiage placed on a completely solid-colored background. Therefore, we have perfected a technique for our sewing team to digitally print the graphic desired, and independently applique it directly onto a durable substrate to create the look that our clients are envisioning for their custom drapes. 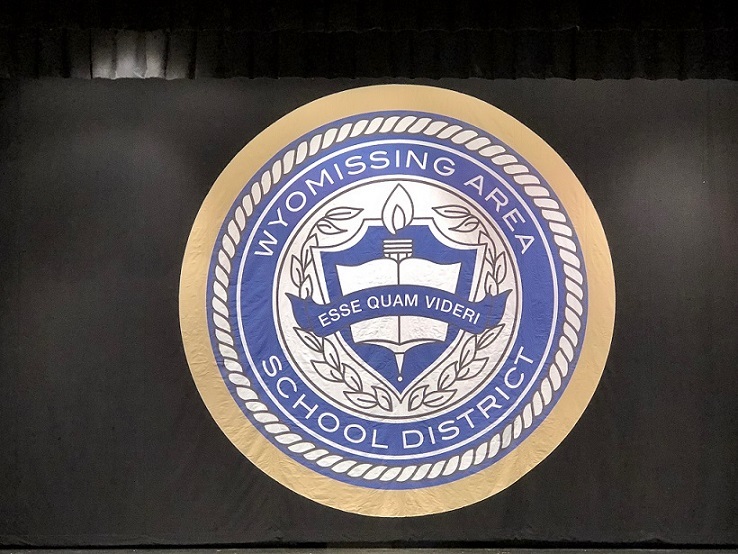 Recently this exact circumstance came up when our sales rep extraordinaire Marilyn Moss was working with her tireless and attentive client, teacher Pete Beck with Wyomissing High School. 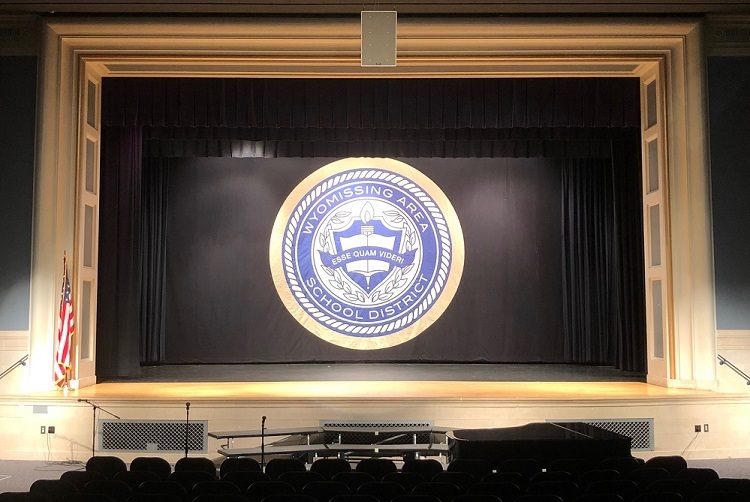 This nationally recognized high school near Redding, PA wanted us to build them a beautiful new custom stage drape with their school’s crest emblazoned on it. To have this beautiful design really “pop”, and to also reduce the overall cost for the finished product, we digitally printed the district’s emblem on Heavy Knit and then flawlessly hand-sewed it directly onto durable 22oz. Encore Velour. Not only did this help lower the price quite a bit, but it also gave this curtain a more “theatrical drape vibe” using the softer velour backdrop fabric instead of being entirely made from a digital print substrate. Plus, the colorful digitally printed graphic really stood out wonderfully against this rich, velvety all-black background, too. They could not have been more pleased with the outcome, and from these photos you can certainly see why! Let Marilyn and our team of drapery experts assist you with all of your upcoming theatrical drapery needs, too—rental or purchase—by providing you with absolutely striking results and still staying within your budget. Color—it can truly help you create a completely one-of-a-kind design, and is a considerable aspect of “branding” yourself for your audiences to recognize far beyond even your name, image, or graphics might be able to do. Our artistic and savvy clients know this, which is why we try to offer them colored rental drapery whenever possible, in order for them to really “hit home” their event’s overall focus. Recently we were thrilled to be able to work again with the dynamic event producers Michael and Deb Roccoforte with FORTE, by helping supply them with some of our striking rental pipe pocket drapery that they needed for a genuinely important event for their own client, Wabash College. Taking place at the renowned Indiana State Museum, they knew that the school’s bright and identifying color scheme is highlighted by a brilliant rich shade of red. Therefore they wanted to have a likely-colored background for all of their own digital banners and cubes decorating the event space, to better tie everything together into one eye-catching theme. 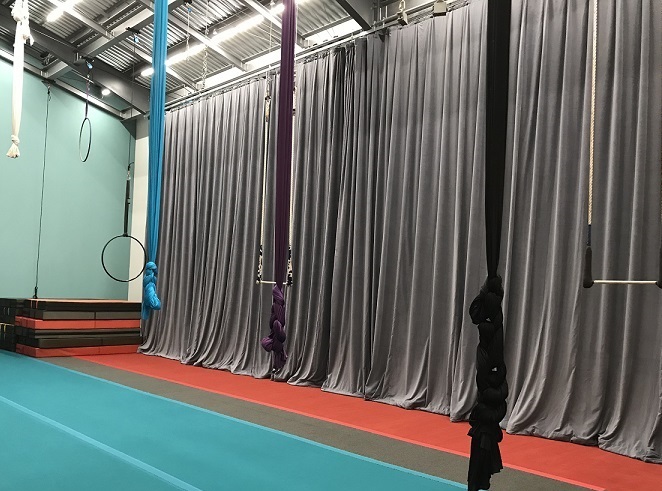 Choosing from the various colors of rental pipe pocket drapery that we offer to use with their own existing pb hardware, they decided on renting some of our gorgeous Atomic Red Super-Vel pipe pocket curtains that wove in beautifully with the school’s distinctive color motif. This 8oz. fabric is quickly becoming a fabulous and economical alternative to heavier velour fabrics with a very similar look and feel. 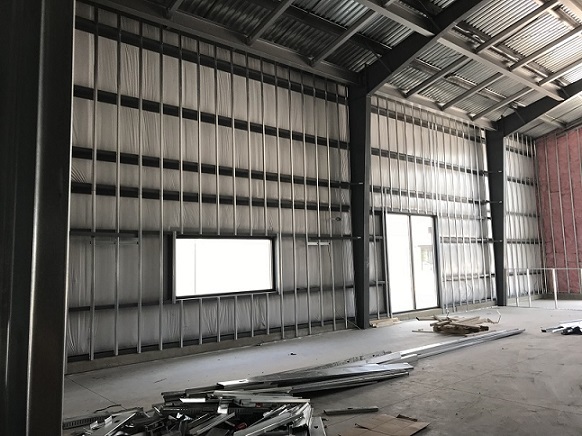 These curtains are also ideal for travel, as this type of inherently flame retardant, lightweight fabric is durable, wrinkle resistant, and road-tough. 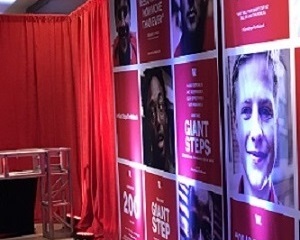 We were so incredibly pleased to see what an outstanding job they did for this event’s memorable design, and were also absolutely delighted with what a perfect background these drapes made for the school’s marketing pieces. Check out our website to see the numerous colors and sizes of pipe pocket drapery that we offer in our rental collection. And we would love for you to contact one of our helpful sales reps today to see if we can provide you with rental or custom pipe pocket drapery for your next big upcoming special event, too. As I’m sure you’re aware by now, everyone here at SW? Inc. LOVES to celebrate all of the special occasions, holidays, and—well, days that end in“day”— occurrences of the year with a delicious meal together, and some really strong belly laughs. 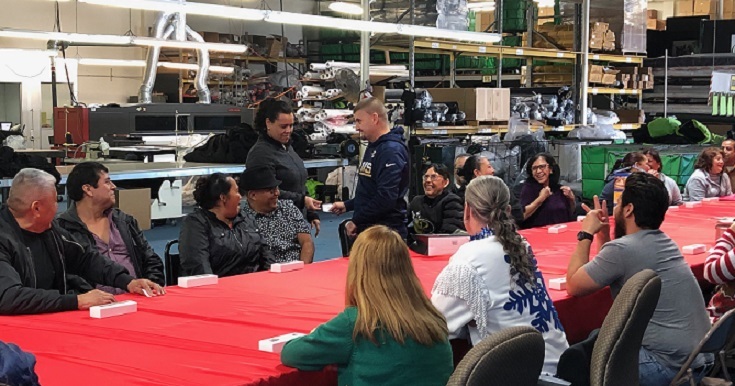 This past week all of us had an absolute blast at our yearly “White Elephant Gift Exchange” and brunch event here at our warehouse. Consisting of what is ultimately one of the most competitive, debaucherous, and hilarious games you can play with this mischievous group of individuals, everyone (in chronological order) chooses a gift from the ones brought in by all of the employees. Then the next person can either choose a new gift or “steal” the first person’s gift. This continues until everyone has a gift, and each specific present can only be “stolen” three times before it’s finally safe with its official—and thrilled—recipient. As you can imagine, the adrenaline kicks in as gift after gift get unwrapped,and everyone decides exactly which one they want to have, which ones are still available to grab, and which ones are locked in with their new “owner”. Just when you think you’re safe, someone else comes along and steals your prize, and then the whole game starts again for you. 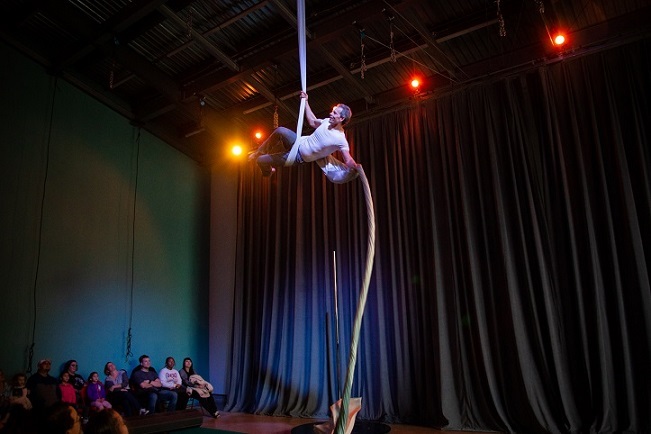 With some truly entertaining and enticing options, this is always one of the most uproarious experiences we have the entire year! This event was made even more enjoyable by following it with a scrumptious brunch buffet—made of a heaping platter of “bionico” (a Whatter’s favorite), delectable Mexican sweet breads, a delicious homemade breakfast casserole (from our very own general manager Lynda Vaughn), and an array of fresh fruit juices to help wash it all down. 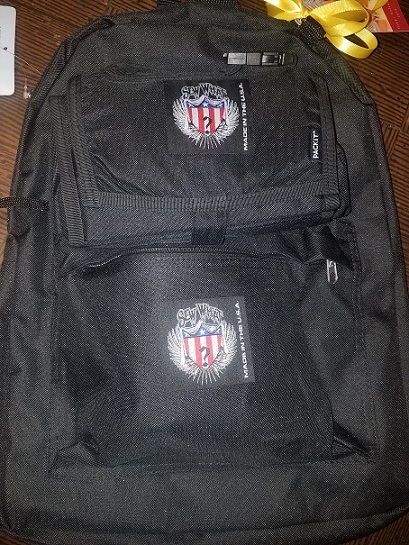 Then our company head, Megan Duckett, treated the entire staff with custom made backpacks and thermal pouches for the entire staff—with the SW logo emblazoned on them. What a wonderful surprise! We are so unbelievably lucky to work in an industry that is always captivating,ever-evolving, and filled with some of the most amazingly creative people around. 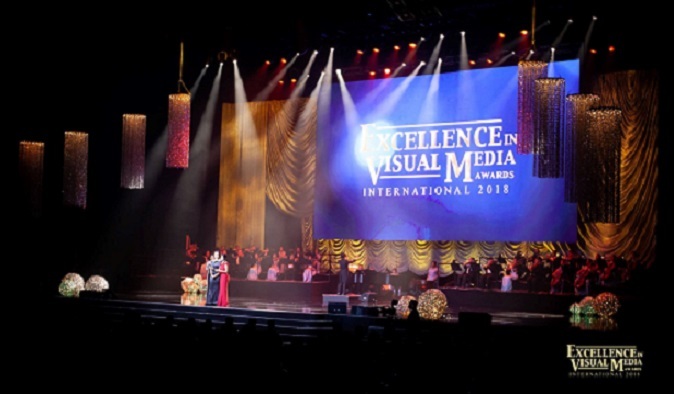 Our clients continue to wow us with their design visions, and we are always humbled when asked to be a (large or small) part of their incredible stage designs. But it is HARD WORK, and getting to let loose from time to time and appreciate one another as friends and colleagues is a great way for our entire team to recharge our collective batteries.Then we can be fully ready to continue dazzling our clients once again with the most stunningly beautiful rental and custom theatrical stage curtains around. We honestly hope that you and yours have had a fabulous holiday season so far, and a VERY Merry Christmas this week. From our family of misfits to yours, we wanted to wish you a genuinely wonderful, healthy, and happy2019 to come. We would not be able to do it without you!